LITTLE ROCK, Ark. -- A man yelled "Freedom!" as he crashed his vehicle into Arkansas' new Ten Commandments monument early Wednesday, nearly three years after he was arrested in the destruction of Oklahoma's monument at its state Capitol, authorities said. Arkansas Secretary of State's Office spokesman Chris Powell said a man drove through the statue around 5:15 a.m. on Wednesday while filming on his cellphone, CBS Little Rock affiliate KTHV-TV reports. Officials believe a Facebook Live video posted on a Michael Reed's Facebook account that depicted the destruction is authentic, Powell said. In the video, the sky is dark and the Arkansas Capitol's dome is visible. Music is heard followed by a female voice, likely on the radio, saying, "Where do you go when you're faced with adversity and trials and challenges?" The driver is then heard growling, "Oh my goodness. Freedom!" before accelerating into the monument. The vehicle's speedometer is last shown at 21 mph and then a collision can be heard. 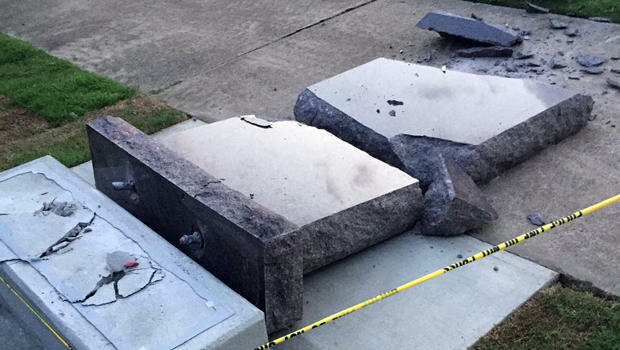 Arkansas' monument fell from its plinth and broke into multiple pieces as it hit the ground. The debris had been cleaned up by midmorning Wednesday. In an earlier video posted to the same account on Wednesday, a man who identifies himself as Reed discussed his religious beliefs. "But one thing I do not support is the violation of our constitutional right to have the freedom that guarantees us the separation of church and state because no one religion should the government represent," the man says. Oklahoma County Sheriff's spokesman Mark Opgrande told The Associated Press on Wednesday that Reed was arrested in October 2014 in the destruction of Oklahoma's Ten Commandments monument at the state Capitol. Opgrande confirmed that the suspect arrested Wednesday in Arkansas was the same person arrested in the Oklahoma case. In a 2015 email to the Tulsa World, Reed apologized for wrecking Oklahoma's monument and said he suffered from mental health issues. Arkansas' granite monument weighed 6,000 pounds. It was installed Tuesday morning on the southwest lawn of the Capitol with little fanfare and no advance notice. A 2015 law required the state to allow the display near the Capitol, and a state panel last month gave final approval to its design and location. "Obviously, I'm very disappointed that someone would carry out an act of violence that's actually against the people of Arkansas," said Republican Sen. Jason Rapert, the state lawmaker who led the push for the monument. Rapert said he was confident he could quickly raise funds for a replacement. Travis Story, the general counsel of the American History and Heritage Foundation, which raised money for the monument, said the group has already ordered a replacement but that it would take a couple months. Republican Gov. Asa Hutchinson, who signed the legislation requiring the monument's installation, called its destruction "very troubling." "Resorting to property destruction is never the answer to a policy disagreement," he wrote in a tweet. Resorting to property destruction is never the answer to a policy disagreement. Very troubling that a Capitol monument is destroyed. Former Gov. Mike Huckabee also took to Twitter after hearing about the incident. "Some idiot in my home state broke all 10 commandments at the same time," Huckabee said. "He wasn't Moses and it wasn't Mt. Sinai." The American Civil Liberties Union said Tuesday that it planned to file a federal lawsuit challenging the monument, calling it an unconstitutional endorsement of religion. Arkansas' monument is a replica of a display at the Texas Capitol that was upheld by the U.S. Supreme Court in 2005. After Oklahoma's monument was destroyed in 2014, a replacement was erected but then ordered removed by that state's Supreme Court, which determined its location on state property violated a constitutional prohibition on the use of state funds to support a religion.